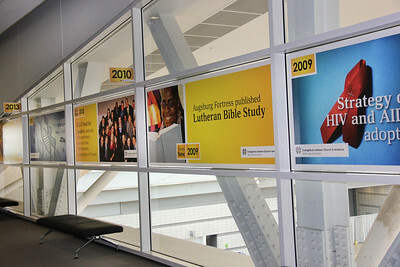 General pictures and supporting graphics. 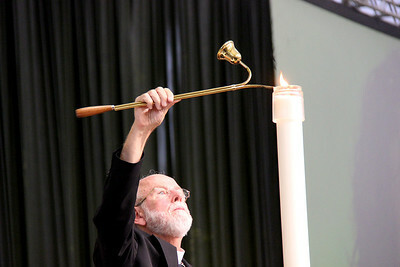 Presiding Bishop Mark S. Hanson lights a candle at the opening of the Assembly. 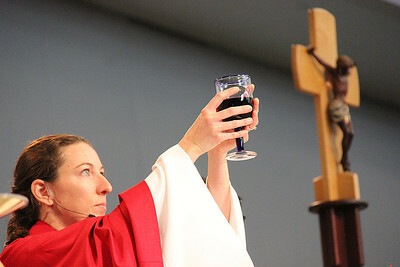 Bishop Hanson during worship services on Monday, August 13, 2013. 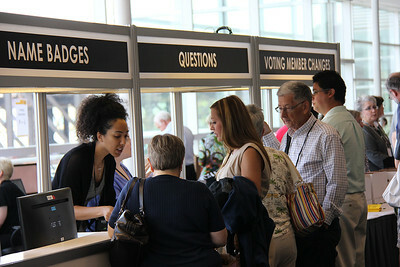 Voting members utilize an electronic Guidebook at the 2013 Assembly. 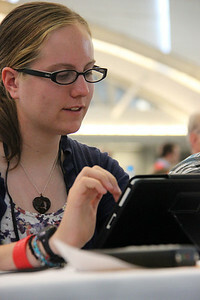 Natalie Young helps register voting members. 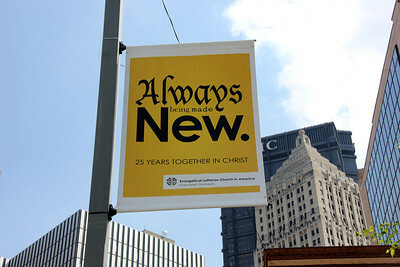 A photographic timeline shares highlights from 25 years. 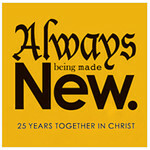 CWA 2013 Theme: Always being made new. 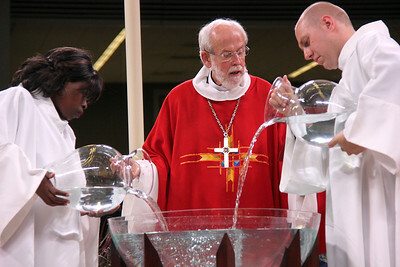 Presiding Bishop Mark S. Hanson leads the thanksgiving for Holy Baptism. 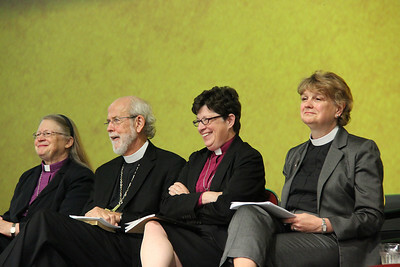 Bishop Jessica Crist, Presiding Bishop Mark Hanson, Bishop Elizabeth Eaton and Bishop Ann Svennungsen, nominees for presiding bishop, wait to respond to questions. The Rev. 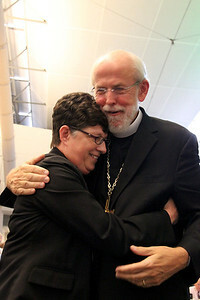 Elizabeth A. Eaton, bishop of the Evangelical Lutheran Church in America (ELCA) Northeastern Ohio Synod, was elected Aug. 14 presiding bishop of the ELCA at the 2013 ELCA Churchwide Assembly. 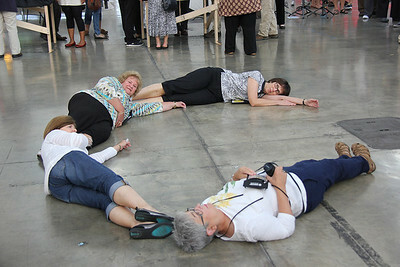 She was elected on the fifth ballot. There were 889 votes cast, and 445 votes were needed for an election. 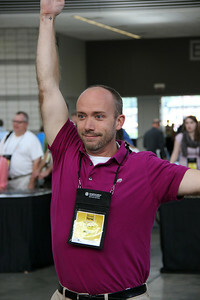 Eaton received 600 votes and the Rev. 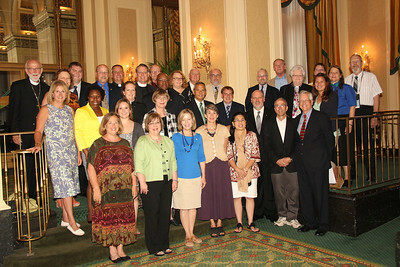 Mark S. Hanson, ELCA presiding bishop, received 287. 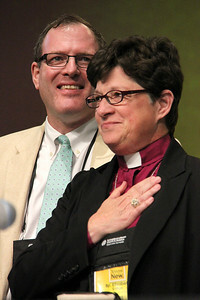 Eaton is the ELCA's first woman presiding bishop-elect. The Rev. 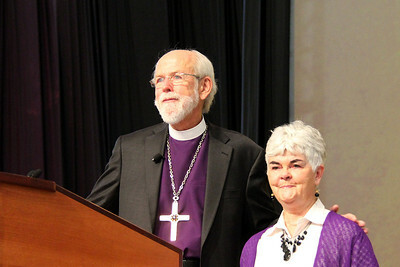 Elizabeth A. Eaton, bishop-elect, comes to the stage with her husband, the Rev. 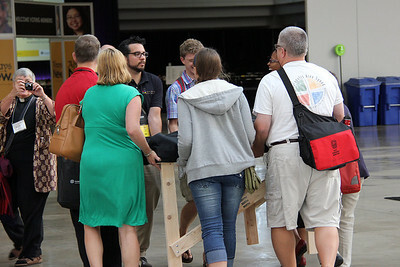 Conrad Selnick. 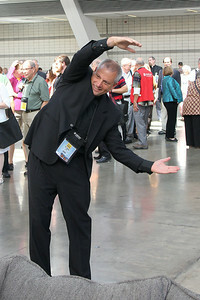 Presiding Bishop Mark Hanson congratulates the Rev. 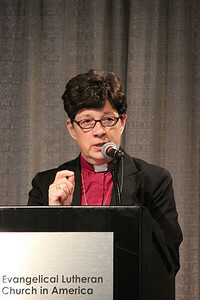 Elizabeth A. Eaton. The Rev. 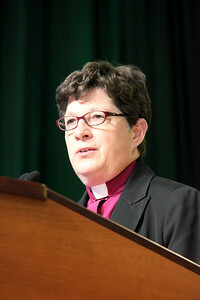 Elizabeth A. Eaton, presiding bishop-elect, answers questions at a news conference on Wednesday, Aug. 14. 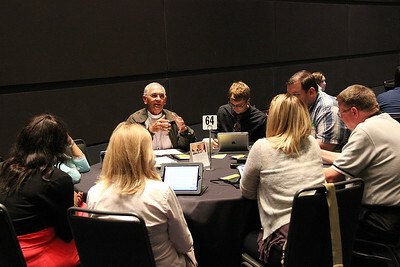 Voting members participate in daily Bible study. 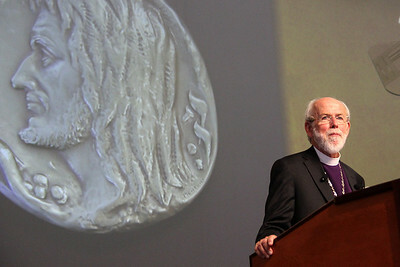 Presiding Bishop Mark S. Hanson receives the Servus Dei Medal. 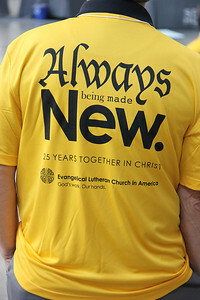 This medal honors officers of the Evangelical Lutheran Church in America at the completion of their terms and continues a tradition that was begun in our predecessor church bodies. 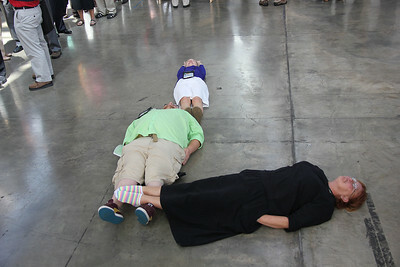 Mrs. Ione Hanson stands by his side. 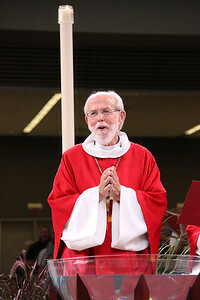 Presiding Bishop Mark S. Hanson receives the Servus Dei Medal. This medal honors officers of the Evangelical Lutheran Church in America at the completion of their terms and continues a tradition that was begun in our predecessor church bodies. The Rev. 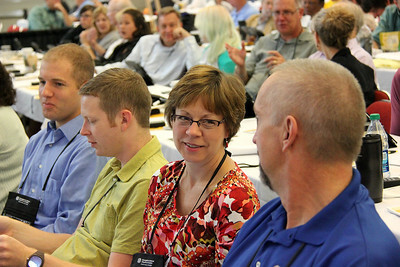 Mark S. Hanson, presiding bishop, asks voting members to turn to someone and talk about one person whose witness has had a strong influence on their faith life and one person to whom they are now witnessing. 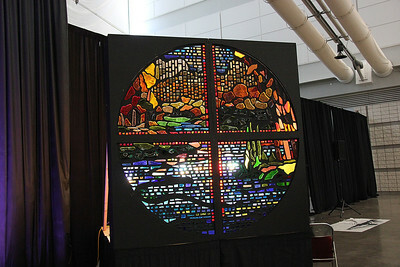 The stained glass window is moved to the plenary hall. 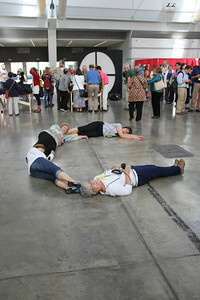 A voting member takes a minute to relax. 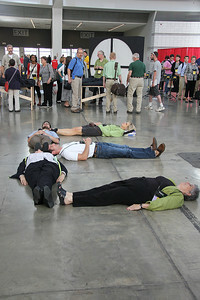 Assembly members help spell out E-L-C-A! 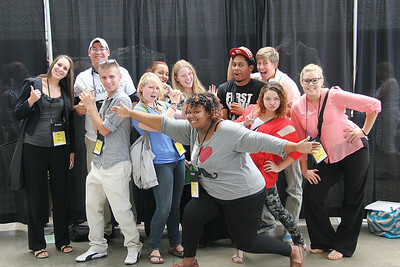 A group poses for the camera. 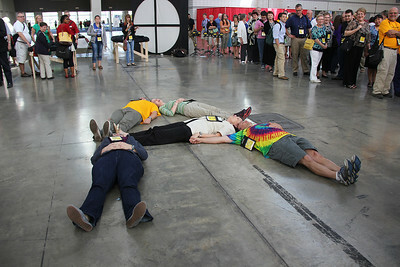 A stained glass window was created during the week of the Assembly.